This is a remix of an early work composed and recorded in 2006, but with a HUGE difference — I’ve got narva9 on vocals! I’ve never met narva9 personally. Learned about her work via ccMixter. Discovered this band by chance. Love the vocals, their sound and the melodic progression of their songs. They say the journey is sometimes more important than the destination. In our case, I think Adrian would agree. I mean, we love the end results and have always been focused on that. But it’s the collaborative musical process that sustains that buzz. Here’s a list of OWOM tracks with links to their individual posts as they were developed. They’d give you a clue, but not quite 100% of the “making-of” process, since Adrian and I tend to discuss the songs over email and chat (I’m sure you’d be entertained by our transcript but maybe for the wrong reasons LOL). You can download the entire album, or the individual tracks, from this post. http://www.archive.org/download/2009OneWorldOneMoment/01_One_World-StarfishStories.wordpress.com_64kb.mp3First post here (May 08). Which was immediately followed by Firdaus’s super-cool remix. The song was refined for the MTL Paralympics supplement CD (Aug 08). The feather on the cap was this Music Video (Sept 08). Adrian agreed with me that this should be the lead song for the album, as we wanted to start with an uplifting mood. 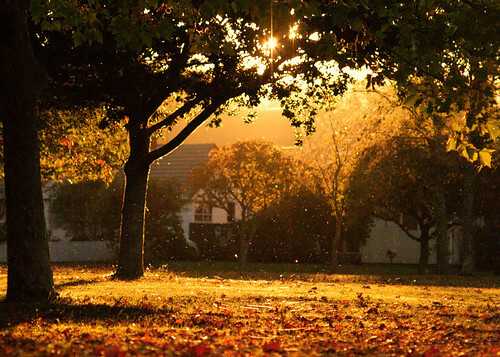 http://www.archive.org/download/2009OneWorldOneMoment/02_Quiet_Afternoon_2.3-StarfishStories.wordpress.com_64kb.mp3First and only post here (Sept 08). It was the obvious choice for the second track, as it offered a nice contrast to the loud and relatively noisy Track #1.
http://www.archive.org/download/2009OneWorldOneMoment/03_Genetic_reMix-StarfishStories.wordpress.com_64kb.mp3This was the longest track in the entire album (posted Sept 08). But I’d like to think that it’s worth it. If you take into account the title, maybe you can get an idea of the story behind the music. http://www.archive.org/download/2009OneWorldOneMoment/04_Rainy_days_2.4-StarfishStories.wordpress.com_64kb.mp3This song had the most number of refinements among all the tracks in the album (Sept 08): This post has versions 1, 1.1, 1.2 and 2; Version 2.1 appeared the next day, and then a version 2.2 (what can I say? I was on a roll! ); this semi-acoustic version v3 didn’t make the cut. There’s no version 2.3 posted (the skip in version was from my editing done at home). 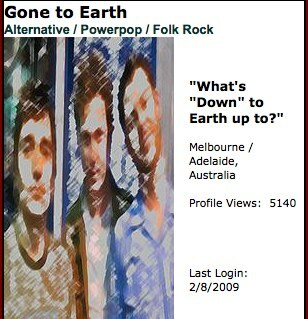 http://www.archive.org/download/2009OneWorldOneMoment/05_Surfing_on_Solar_Winds-StarfishStories.wordpress.com_64kb.mp3Something composed in 2007 and then released in Mar 08. The final version you’re listening is slightly different from what was previously posted, as I’d reworked the bass sounds a little. But since it didn’t drastically change the song, I didn’t rename it as a different version. This song was also given as a birthday present. http://www.archive.org/download/2009OneWorldOneMoment/06_Have_I_Told_You_Lately_Part_2-StarfishStories.wordpress.com_64kb.mp3Posted in July 08. At first I was apprehensive about including this in OWOM. Mainly because I sang the vocals! But since this song has a special place in Adrian’s heart (as he likes to tell me), and especially since the song fitted the “One Moment” feel, it made the cut. http://www.archive.org/download/2009OneWorldOneMoment/07_Drifting-StarfishStories.wordpress.com_64kb.mp3This track has never been posted. So this album is its first appearance. It’s meant to be an interlude of sorts, between songs — or what I’d like to think as “between the mood of the songs”. I included it as a demo track when Adrian and I reviewed songs for our second album. Adrian said it was nice so we considered it for OWOM. It made the cut. 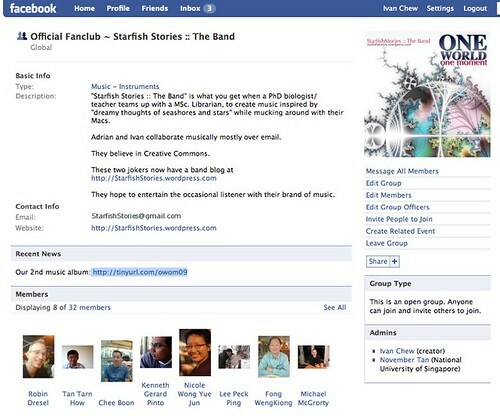 http://www.archive.org/download/2009OneWorldOneMoment/08_Firefly_1.4-StarfishStories.wordpress.com_64kb.mp3This was one of the earliest song posted in 2008. Adrian posted this in Feb 08 but I only got round to it in Sept 08. The final version for OWOM features a different guitar ending, based on Adrian’s comments on the first remix. I also added a percussion layer, as a contrast to the mostly repeated melody. We considered ending the album with this song, but I told Adrian it might inadvertently sound like closing the tracks on a sad note. So this song switched places with “The Hill”. http://www.archive.org/download/2009OneWorldOneMoment/09_The_Hill-StarfishStories.wordpress.com_64kb.mp3This was supposed to be the eighth song, but I thought it would be more apt for the whole album to finish off on a high. Posted in Dec 08 (but actually I’d completed this more or less in mid 2008). This song features no guitar leads at all, and is vastly different from anything Adrian and even myself had produced so far. It’s included as Adrian gave the “bee boo bee boo” a thumbs up. This is one of my personal favourites. I still get goosebumps (the nice kind) listening to it. Heh, I’m surprised at our productivity, given that all this music making is done with our spare time outside of our day-jobs. We welcome comments on how to improve our music. Feel free to comment about what it is that you liked or disliked. I’ve never met Mr. Ivan Bridgewater. We emailed a few times, after I wrote to him to thank him for allowing people to use his video clip (his clip was the lightning strike that was featured in the One World MV). I loved the new Album. The music is well edited and kept my interest with no problem. I was wondering if you are going to put the music to video. This music cries out to be used as part of a video. I know that will take time, but after seeing One World I know you are up to it. I highly recommend this album to anyone who loves good music. Thanks for your kind words, Ivan B.
I don’t have plans to make a music video for OWOM. Finding suitable licensed footage is the challenge. But you’re making me think about it. Maybe a montage of the OWOM album, rather than individual songs. That might be more feasible. I’ll certainly think hard about it! Check out more of Ivan Bridgewater’s videos at his YouTube page.